The night is aphotic, but anyhow it passes leaving the trees, the stems, the flowers, the petals looking aqueous; leaving the eardrums still attentive to the sounds like a berserk ape beating hundreds of metal cans all together. Another day arrives when the clouds are still masking the sun. Her little palm grabs my index finger, pulling gently, almost rushing me to lead her to the already traveled road to the school. The crispness of the air outside fills the lungs, inspiring them to ignore another shot of smoke injected in today. Her little feet travels jumping over the puddles, while I enjoy the morning bird sing into my ears and a drop of arctic like water lands gently on my right cheek. I wish all my worries are snatched away from me today, no matter how much I try to hold them close to my hurting chest. I wish to see a speeding cloud incoming and hauling me away on its cushion like pew. Every new wrinkle on my skin is forcing me to draw a bit more of my interest out of the irksome responsibilities, which once I thought was an achievement at work. While things that don’t really matter in life engrosses my mind, I step in the puddle. Right there her candy coated voice interrupts my thoughts. “Did your socks got wet?”, her curiosity sounded through her smile. Her innocence brings me back to life. This is reality. I know I was missing out on a lot and I now know it is time to turn around. 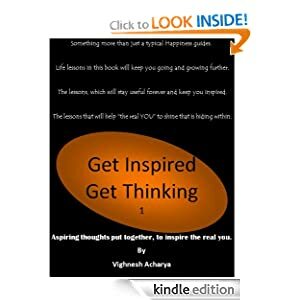 Download Volume 1 of “Get Inspired Get Thinking” – the ebook, that has 25 chapters. Exclusively on Amazon kindle. March 8,9,10, 17 and 19. Don’t miss out on a great deal.